Crisis prevention and intervention in healthcare or simply put: management of assaultive behavior is an effort to provide protection for the client and healthcare professional against any type of assault from either party. Assaultive behavior in the healthcare setting compromises the safety of the healthcare workers, the patients and visitors to the emergency rooms, mental health units, group homes, long term care facilities, etc. The abusive behavior undermines the efforts of the health care professionals that are in many cases, the victims. Poor behavior management costs the hospital time, money and high turnover rates. This book discusses the meaning of assaultive behavior and crisis, the types and causes of crisis, General safety measures, Personal safety measures, The assault cycle, Aggression and violence predicting factors, Obtaining patient history from a patient with violent behavior, Characteristics of aggressive, and violent patients and victims, Verbal and physical maneuvers to diffuse and avoid violent behavior, Strategies to avoid physical harm, Restraining techniques., Appropriate use of medications as chemical restraints, and lastly, emergency preparedness for hospitals. Each of the seven chapters has assessment questions to ensure proper understanding of the topics taught. 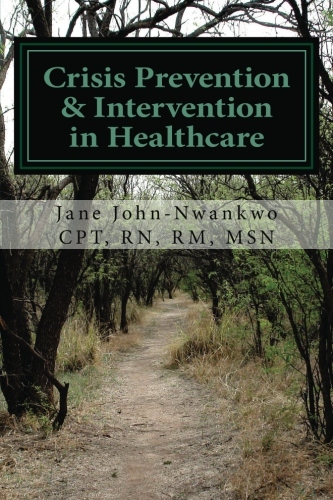 This is an ideal textbook to teach healthcare professionals about Crisis Prevention & Intervention in Healthcare.